Few... that was a busy couple of days. v1.63 is now ready and under review for the app store. Sorry for the mess up, everyone. Just to win back favour, I added a bonus feature that I was preparing for v1.7 - example compound kanji on each sticky (see screen shot below). These compounds (words) are taken from the JLPT data set so you won’t get any bizarre “out there” Japanese words that you’ll never actually need. - [Added] Move, copy and delete groups of stickies between files (list view). 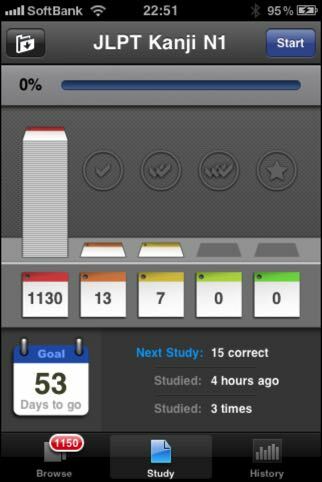 - [Added] On the study screen, the number of times studied has been replaced with total time studied. Remember, if you don’t tell me about bugs/ideas, I’ll probably never know. Available in a week or so. ✪ New examples view with hiragana readings (furigana). ✪ New study algorithm - recycles “Passed” stickies more often. ✪ Option menus slightly re-organised. ✪ “Studied:” text in study view sometimes not updating. Fixed. ✪ Wider toolbar in browse view on the iPad. ✪ “JLPT4 Vocab” correction: Handbag -> Hamburger (needs reinstall). Available in a week or two. Somebody mentioned that getting every sticky right FOUR WHOLE TIMES was just plain hard work - especially for big files. At first I thought, “These young kids..” then I realised, maybe it would be nice to soften the blow a little. 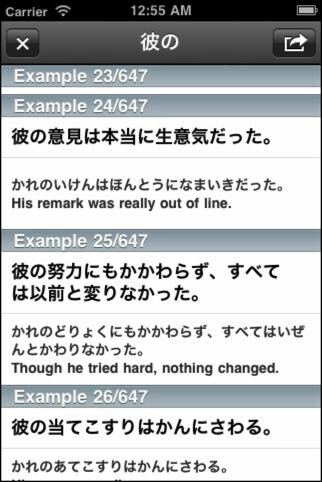 The next version of Kanji Pro (v1.4) will have a new “Perfect” button when studying. One press, and the sticky is elevated to green utopia and never asked again. If the display appears to be reloading more than necessary, the device may need a restart to free up memory. I’ve updated some code to help in this area which will be released in the next v1.4 update. Also, I’ve included an option to reduce memory size by 25% with the caveat of making zoom a little less zoomy. On the plus side, redraws should be a little faster for large files. Thanks to changing the colour scheme in my apps, I’m having to update all the screenshots on this website. I don’t think I’m going to do that again in a hurry. 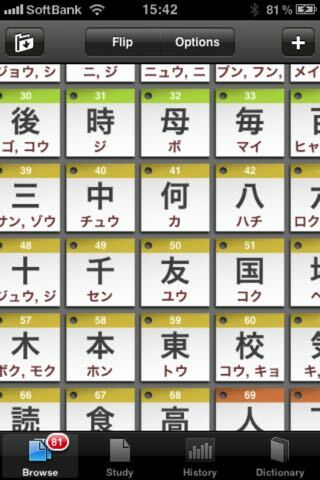 As of now, only Kanji Lite has appeared in the app store with the new, updated colours. The other 3 will follow shortly. After sweat and tears, Kanji Pro is now a universal app and runs on the iPad and on it’s smaller brothers; it should be available in a week or so. How does it run? Coming from the iPhone version, the difference in screen real estate is a bit of shock - you can clearly make out the 1945 Joyo Kanji on one screen without even zooming. Scrolling is nice and smooth (in tile and list view) and screen redraws are about 2 or 3 times faster. The new version has a few kanji corrections in the data files but these will only be seen on a fresh install because your statistics for each sticky are stored in the same file - if I update your files, I’ll erase your stats. I thought it best not to do that. Note: Only Kanji Pro will be made universal. Making Kanji universal and changing it to run on my trusty friend the iPad is getting a little closer to reality. After giving it a test, it looks great! It still needs some work but I look forward to getting something out there soon. I have no intention of separate iPad/iPhone versions so it’s all good for those who’ve already taken the plunge. I’ll keep you posted. My time this month has been absorbed by bug fixing and “tweaks”. Fingers crossed, things have settled down a little and I can start adding features. 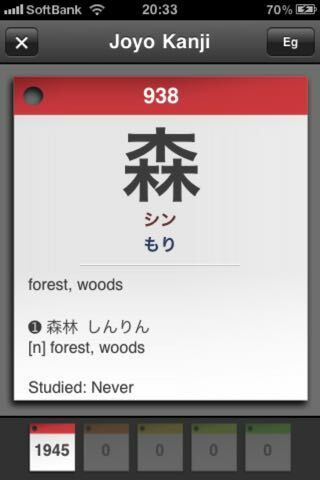 For you JLPT guys and gals or those who want to get into kanji, “Stickystudy: Kanji” is now available.